Negotiable, According to your needs. Side Top Rail: 2-3/4”*1/2”MDF with black PVC and silver PVC rim. End Top Rail: 5-3/4"W × 1/2” MDF with black PVC and silver PVC rim. Aprons: 14-1/2”*1/2”MDF with black color PVC. Legs: New-style 4.5”*4.5”*5/8”MDF with black color PVC. 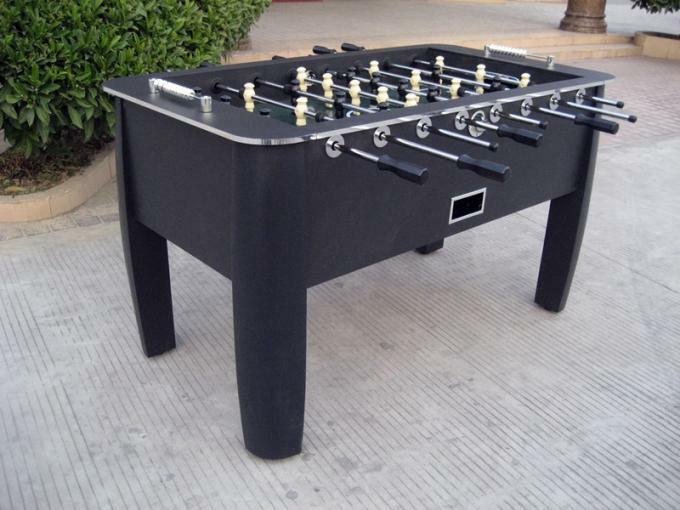 Play Bar: 5/8″steel rod with chrome and plastic Eight-Square handle . Ball return: Plastic side ball return. Leg Levelers: Dia.45 mm plastic leg g levelers 4 PCS. Scoring: Abacus-style plastic with chrome bead scoring 2Pcs. 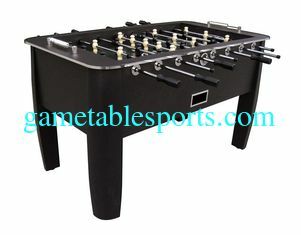 Because we are a professional game table and game table accessories supplier. We are committed to your 100% Customer Satisfaction! We do our best to process your order with care and to ensure that your needs are met with the uppermost satisfaction. 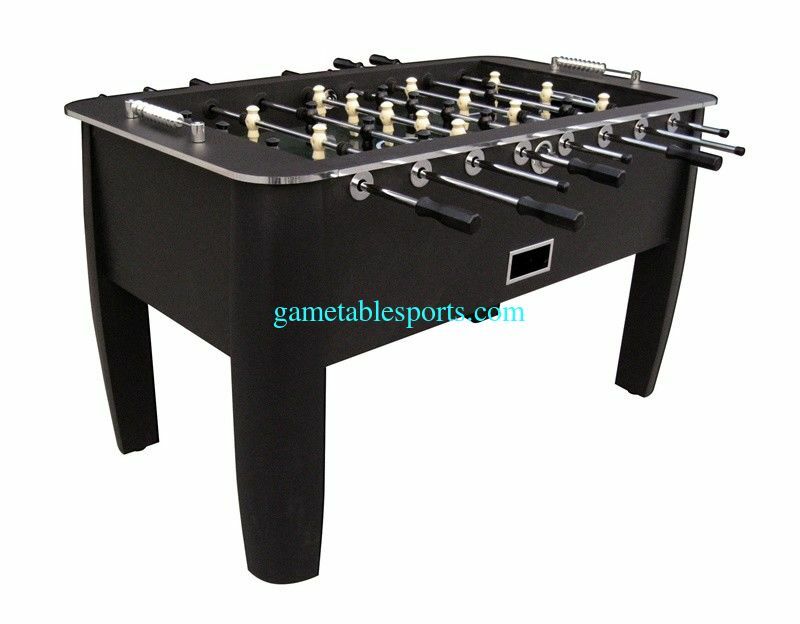 We have a great selection of game table products that are typically hard to find from other suppliers. We provide the best selection, best quality and the best price. We accept small order or several items in a container. we also accept sample order. Usually we send the products of sample order by EMS,DHL, UPS,FEDEX,TNT, it takes about 3-5 working days from our company to customer’s destination. We do our best to process your order with care and to ensure that your needs are met with the uppermost satisfaction. Our team members will double check any product before dispatch to avoid any problem for quality and packing, and to avoid any quality problem happens during the transit. If you want to know more details of our products please feel free to contact us! Welcome to visit our factory to check our production capacity and more about our NEW products. Our QC department is responsible for products quality planning and quality management work, implement raw material and finished product inspection standard, analyses all kinds of quality recorded data. The R&D department is the core of us. Shoulder heavy responsibilities of Research, developing new product perfecting the product. Every year company invests 10% of its annual revenue in research and development. Confirm the price, lead time, product details, payment term etc. We send the Proforma Invoice to confirm. Customer pay the deposit and send us Bank Slip. Initial Production Stage:Inform the clients that we have got the payment and will arrange the production & inform the estimated leadtime.If pre-production sample is requirested by customer, we will prepare the sample and send to customer.we don't do to mass production until we got approve from customer.We will advise the exact shipping date once customer confirm the sample is ok.
Middle Production:Keep you informed of the whole production situation by sharing with you the photos. End Production:Send you finished product before the balance payment. 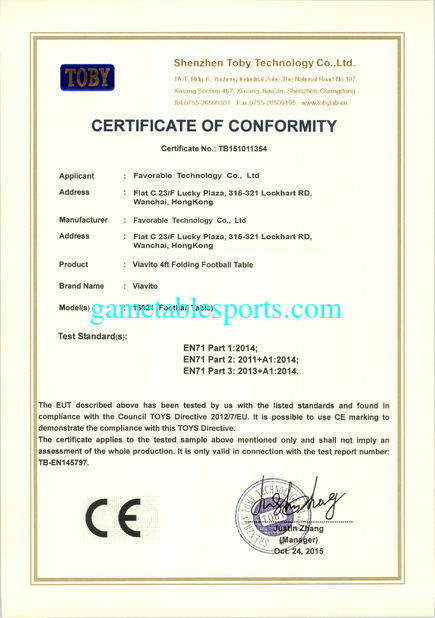 You can also arrange the third party Inspection,if you third party inspection. Clients make payment for balance and we ship the goods after the payment. Also can accept payment term-Balance against B/L Copy Or L/C payment Term. Order can be say “finish” when you receive the goods and satisfy with them . 10. Feedback to us about Quality, Service, Market Feedback & Suggestion. We can do better.Appreciated! A: Sample order is acceptable. Please contact with us and make sure what sample do you need. Q: What about the leadtime? A: In general, the leadtime is about 15 to 20 days. But please confirm the exact delivery time with us as different product and different quality will have different leadtime. Q:How about the packing shipping? A: Normally, We have carton and foam for packaging. If you have any other special requirement. Please feel free to contact us. A: That’s ok to have your own logo on the products. Please contact with us to make sure the detailed things before placing order.